So at this point you've filed your mechanic's lien against a client's property after the client never paid the invoice for a completed project. Now the client has finally paid off the lien or maybe you've come to some agreement with the client to accept a lesser amount. You're free to forget about the ordeal and move on to prepare for your next job, right? Not quite; Nevada lien law requires you to perform one additional step of filing a notice of discharge to provide public notice that you are no longer claiming a lien against the title. It is essential to properly file and record this notice because you can face potential consequences by skipping this step. By this time, you've already complied with statutory lien law to the letter in order to obtain your lien, so don't be sloppy now. The discharge of lien form gives notice to the owner, other lien claimants, and anyone else with a potential interest in the subject property that the lien has been paid in full or has otherwise terminated. If you obtained a mechanic's lien and the debtor or other person responsible for the lien pays the debt or you discharge the lien for any other reason, you must file a discharge of lien notice. 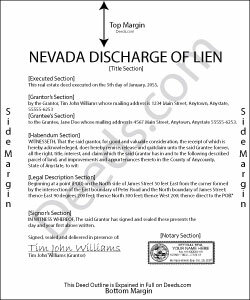 As soon as possible, but not later than 10 days after a notice of lien upon the property (pursuant to NRS 108.221 to 108.246) is fully satisfied or discharged, the lien claimant must record a discharge or release of the notice of lien drafted in substantial compliance as required by Nevada lien law. Serve the discharge notice on the owner personally or by certified mail. Failure to file this notice in time exposes you to potential liability in a civil action (pursuant to NRS 108.2437). Because a lien is a burden on the property (and the owner) and can discourage or prevent a sale, transfer, or refinancing, neglecting to discharge the lien can cause the owner damages, thus entitling her to a legal remedy. For instance, you may be liable for the costs of a lost sale or damages caused by a lender's refusal to extend credit due to the mechanic's lien on the collateral property. Even if the failure to discharge the lien did not cause any actual damages, Nevada lien law allows for a statutory penalty award of $100 to the owner. The owner or heirs are also entitled to reasonable attorney's fee and the costs of bringing the action. Again, it is essential to properly discharge any lien recorded against a property once the underlying debt has been satisfied or discharged for any other reason.